In January 2019, Bayridge Secondary School organized a school-wide Wellness Month with great success. 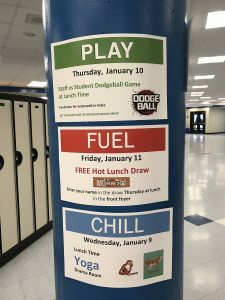 A team of staff and students partnered with KFL&A Public Health to form a Wellness Committee to look at ways to help The committee planned numerous events throughout the month that fit into four categories: Fuel, Chill, Chat, and Play. Each of these categories were chosen because they are identified as being important for improving overall health while reducing stress. Fuel is about fueling your body and mind with healthy food; Chill is about finding ways to relax and disconnect from everyday stress; Chat is about being kind and having fun with friends and Play is about getting active, having fun and laughing with others. Some of the events included fruit kebabs, yoga, staff vs student dodgeball, free hot lunch, music and colouring, cocoa and cram (study session), and pyjama day. We also had an open gym prior to exams to help students be active which is proven to improve cognition and brain function. Bayridge will bring back Wellness Month in April to coincide with mid-terms, and in June prior to final exams.